Lion in the Meadow was written by Margaret Mahy. 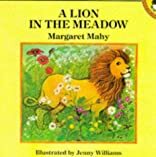 Lion in the Meadow was published by J.M. Dent & Co. Subjects of Lion in the Meadow include Children's Books, and Fiction.